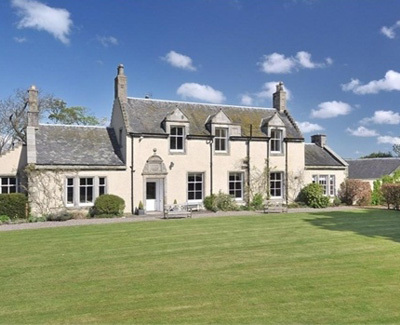 Nether Pitteadie is a beautiful category B listed country house in a beautiful Scottish setting. In addition to the principal house, the stone cottage has been extended to create a large dining kitchen, and the outbuildings have also been totally overhauled. The house dates from circa 1685 with the pavilions added later in 1800. The property has numerous period features such as crow stepped gables and astragal sash and case windows. The hall provides access to the principal reception rooms which are light and airy; the drawing room is a particularly impressive room with a decorative vaulted ceiling and an unusual sun room to the side. The formal dining room is beautifully proportioned and can comfortably sit 14 round the table. The family/play room leads through to a stunning hardwood conservatory with an exposed stone wall and double doors leading to a sheltered walled garden. The kitchen, which is the hub of a family house, has been totally redesigned and a large window has views over the lochan. Adjoining the kitchen with direct access is a sitting room with a triangular shaped fireplace with a granite hearth and pine mantle. Upstairs the master bedroom is dual aspect and has an en-suite bathroom and a dressing room. The ground floor guest bedroom suite has an ensuite bathroom while the remaining 3 large double bedrooms are served by a family bathroom. The house is extremely functional with a large boot room with a wood burning stove which is ideal for drying out clothes and wet dogs. The back door leads to an enclosed courtyard where there is a gun room, boiler room and a large games room fitted out with a bar. The gardens are a real feature of Nether Pitteadie. To the north is a large lochan surrounded by lawns and trees. The lochan which has a platform for fishing and easy boat access is enclosed by a fence making it secure for young children. The formal gardens comprise lawns to the front of the house enclosed by hedging and mature trees below which there are an abundance of spring bulbs. To the side and rear of the house, the garden is enclosed by hedging and a stone wall flanked by flower beds and herbaceous borders which provide colour throughout the spring and summer months. Beyond the formal garden is a kitchen garden with vegetable and fruit beds lined with box hedging. On the wall, there are a number of mature fruit trees including apple, plum, cherry, damson and pear. The kitchen garden lawns lead into a woodland under planted with spring bulbs which has a number of paths through it.There is also a pine copse extending to an acre to the east of the house next to the lochan. To the front of Nether Pitteadie is a large grass field extending to about 16.98 acres (6.87 Ha). The field is ideally suited to horses and livestock and could, if required, be subdivided into smaller paddocks or partially planted with trees. The current owners have, in the past, allowed a local farmer to graze the land. Nether Pitteadie has a wonderful, peaceful, rural location about four miles from Kinghorn while still being within a 25 mile commute of Edinburgh city centre. The house which is approached by a long private drive is surrounded by its own policies, rolling fields and woodland. The guide price is £1,350,000. For further information contact Savills on 0131 247 3711 or visit www.savills.co.uk.